The bedframe itself is the Abbey Trundle Bed from Costco.ca (this model is no longer available, but they have alternatives), made by CafeKid. I was debating whether to go with solid wood or composite wood, which was a tough choice. Lots of composite wood contains toxic chemicals like formaldehyde that continue to off-gas (which you can read about in my post about bedframes), but I did find a Canadian company, South Shore Furniture, that looks pretty eco-friendly. They manufacture particleboard and MDF from recycled fibers, and are ultra-low in formaldehyde (CARB II standards, California Air Resources Board – the most stringent standards in North America). I’ve seen South Shore Furniture carried online at Home Depot, Wal-Mart, and Amazon. I knew I wanted something with drawers, or a trundle, for storage space, and South Shore has lots of “mates bed” options (underbed drawers) and bookcase headboards. It’s pretty reasonably-priced as well, with a whole mates bed and bookcase headboard combo for around $500-$600. However, I thought solid wood would be sturdier if we went with a trundle, and found really positive reviews for CafeKid. It took a bit of digging to find out more about how CafeKid products are manufactured – it lists non-toxic paint and lacquer on their website, but nothing more specific than that. I finally got a hold of one of their representatives who stated, “We use low VOC paints/lacquers. All of the MDF used is E-zero as prescribed by CARB (California Air Resources Board) Phase 2 regulations, which has no formaldehyde.” Phew! A huge sigh of relief for me! So off I went to order it online from Costco. Because it is solid wood it is definitely heavy. But it’s very nice construction and pretty simple to assemble (my husband was able to do it even with my daughter running back and forth, trying to “help” with her toy tools). Plus it’s sweet and girly. Because I wanted to avoid toxins in her bedding, I made her a duvet with organic wool and organic cotton, with an organic cotton cover made with Harmony Art’s organic cotton sateen fabric, Fields of Honey -Pink. 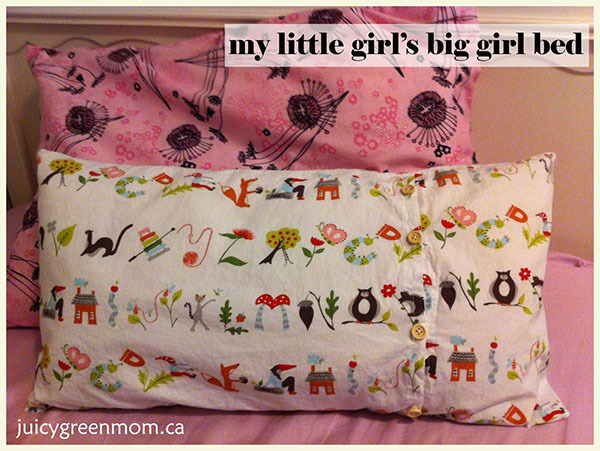 I got the big standard size pillow from Turn a New Leaf Designs, and made the pillowcase myself. I had some leftover wool batting and organic cotton fabric from making the duvet, so I made a couple of extra little pillows with it, and got some cute organic cotton fabric from Cedar House Fabrics (“A is for Apple”, Monaluna Fox Hollow collection) for the pillowcases. And there you have it! 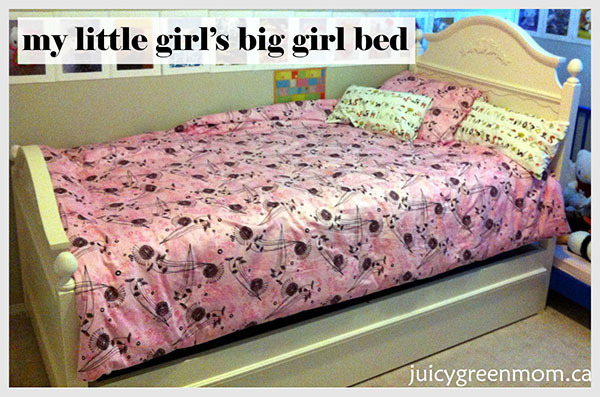 My little girl’s green big-girl bed – done! What bedding do you have in your bedroom, or your kids rooms? Recycling at London Drugs: big companies going green! Thanks, Cher!! 🙂 Yes I couldn’t believe how much digging it took to first of all find out Cafe Kid was the manufacturer, and then find out product details. Sheesh. I hear you about pillows! I’ll have to do some more trying out and hopefully I can come up with a good answer. Beautiful Bed! I am curious how Cafekid’s product holds up. May I ask how the bed is after these few months? Have you encountered any problems with the quality of the product? Thank you in advance. I’m curious to know which mattress you went with for her bed? As I am currently looking at getting my daughter her “big girl” bed and would love any extra advice or input I can find. Hi Jennifer, thanks for your comment. We ended up getting a mattress from IKEA – it was a Heggedal which I believe is no longer made. IKEA does have another natural option though, including the MORGONGÅVA which is mostly natural latex. Any suggestions for non-toxic bedframe for adults? I don’t have any specific brands to recommend, but I would look for solid wood or metal – avoid upholstered!